In his last two months at Northwest Arkansas, Cheslor Cuthbert's slash line was .310/.363/.452 for an impressive .815 OPS. KANSAS CITY, Mo. — The Royals’ organization has been doing a great deal of thinking lately about 21-year-old prospect Cheslor Cuthbert. Cuthbert, in fact, could be a factor with the big-league club come September, especially if first baseman Eric Hosmer’s hand injury keeps him out longer than the three to six weeks that is expected. That is why Cuthbert was told, when he recently was promoted to Triple-A Omaha, that he would be playing almost exclusively at first base. "It’s basically protection for Hoz," assistant general manager J.J. Picollo told FOXSportsKansasCity.com. "Cheslor was really hitting the ball well at Northwest Arkansas, and we want to see if he can pick up Triple-A pitching quickly." If Cuthbert can hit at Omaha, he likely will be a September call-up, having the benefit of already being on the 40-man roster. "We know he can play the (first base) position," Picollo said. "He has soft hands and is athletic around the bag." Cuthbert, you’ll recall, was signed in 2010 as a 16-year-old out of Nicaragua (Big Corn Island) with a $1.35 million signing bonus. He has steadily and incrementally moved his way through the Royals’ system, mostly at third base. The emergence of last year’s top pick, third baseman Hunter Dozier, to Double-A Northwest Arkansas prompted a position switch for Cuthbert, who initially went to first base but then played several games at second base. The Royals have not given up on the idea of converting Cuthbert to second base. "He profiles pretty well at second base," Picollo said. "I would suspect that is where you might see him next season." The Royals have become increasingly intrigued with Cuthbert’s offensive progression. In his last two months at Northwest Arkansas, Cuthbert’s slash line was .310/.363/.452 for an impressive .815 OPS. "He’s really coming into his own," Picollo said. "He’s a player who could be helping us." 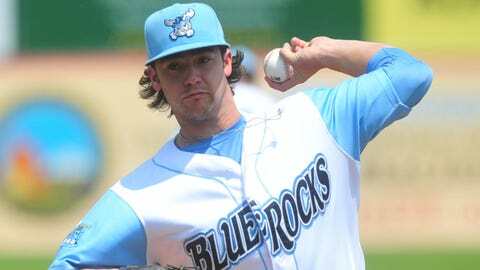 Brandon Finnegan breezed at Class A Wilmington, earning him a promotion to Northwest Arkansas. This year’s top pick, left-hander Brandon Finnegan, made his Northwest Arkansas debut Thursday night, and just like he had done at Class A Wilmington, he breezed. Finnegan threw two scoreless innings. Although there have been suggestions that Finnegan might be a September call-up, it seems unlikely. Finnegan is not on the 40-man roster. "We just don’t want to close any doors and set any restrictions with him," Picollo said. "If he’s lights out at Double A and there’s a way to get him on the 40-man and he would be of value to us at the big-league level, sure, it could happen." 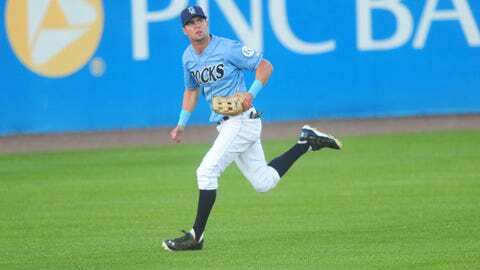 The Royals ‘really like the progression’ Bubba Starling is making at Wilmington. — Bubba Starling, OF. 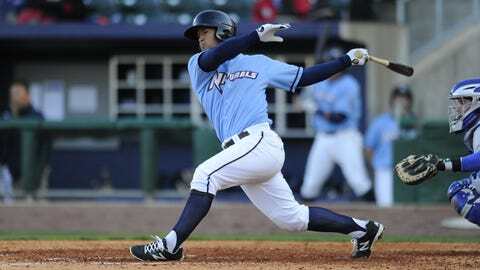 The 2011 first-round pick had a very good month of July at Wilmington (.287, four homers, .818 OPS). He’s tapered off a little in August (3 for 17). "But we really like the progression he’s making," Picollo said. "His frame of mind is solid right now and he’s taking a good approach to the game. He’s making adjustments." — Ryan O’Hearn, 1B. A ninth-round pick this year out of Sam Houston State, O’Hearn, who is 6 feet 3, 200 pounds, has nine homers and 32 RBI at rookie league Idaho Falls while hitting .385. "Nice-looking player," Picollo said. — Alec Mills, RHP. He had Tommy John surgery last season but has bounced back with a 1.23 ERA through four games at low-A Lexington. "Very encouraged by his progress," Picollo said. You can follow Jeffrey Flanagan on Twitter at @jflanagankc or email him at jeffreyflanagan6@gmail.com.